America’s clash of worldviews is clearly portrayed in a new survey by the American Culture & Faith Institute (ACFI). It is no surprise that most adults believe the United States is not moving in the right direction. Since the 1980s, surveys evaluating such perceptions have typically found that most Americans believed the nation was “moving in the wrong direction” or was “on the wrong track.” Whether the president or the party in power has been Republican or Democrat, a majority of the public has not been satisfied with the way things were going since 2003! The widespread concern with the state of the nation and its leadership is evident in the ACFI survey that found six out of ten adults (59%) describe themselves as “angry with the state of America” today. That is actually better than people’s state of mind during 2017, when the average monthly reaction to the national condition was two-thirds (67%) admitting to being angry. The ACFI study also asked adults to indicate whether the nation is on the right track or wrong track today in terms of our politics, economy, morals, and culture. The aggregate responses to each of those inquiries suggests that people are satisfied that we’ve regained our way economically (52%) but also contend that we are moving down the wrong trail culturally (just 38% say we’re on the right track culturally), politically (34%) and morally (26%). In short, people believe we’ve gotten the economy in shape but other critical dimensions of our society are still a mess. Not surprisingly, peoples’ ideological leanings affected their assessment of these four elements of U.S. society. Three out of four conservatives believe the nation is now on the right track economically – but less than half of all moderates (46%) and liberals (41%) concur. In fact, liberals are more likely to believe that during the Trump term of office the United States has lost ground in terms of economic growth, creating jobs, the cost of living, managing federal spending, tax policies, international trade policies, and reducing poverty. For the first time in many years, most conservatives (57%) are confident the nation is on the right track politically. However, less than three out of ten moderates (29%) and liberals (22%) agree. Among the major political concerns harbored by those segments are alleged abuses or decline in the use of federal power, the performance of the judicial system, military and defense efforts, foreign policy, immigration reform, national unity, national pride, environmental policy, and federal government performance. Large majorities of all three ideological groups agree that the U.S. is not on the right track either culturally or morally. The proportion of people from each ideological segment who reject the path currently pursued by the nation is surprisingly similar. An evaluation of peoples’ points of view based upon their religious inclinations highlights the dramatic differences between such groups. The heart of the division across faith groups has to do with whether or not people embrace Christianity. Christians – in all shapes and forms – were far more likely than people who do not associate with Christianity to believe that things are going in the right direction economically by a 58% to 38% split. Christians were also more likely than non-Christians to say things are going in the right direction politically – by a 39% to 24% difference – even though a majority of both groups feel the nation is politically off-track. Interestingly, the reactions of the two religious segments were very similar regarding the moral and cultural direction of the nation, with a large majority of each group believing the US is off-track in both dimensions. The most unusual profile was revealed among SAGE Cons – the Spiritually Active Governance Engaged Conservative Christians. As described in the book, The Day Christians Changed America, SAGE Cons were a critical voting bloc in Donald Trump’s victory. Currently, they are the only faith segment for which a majority believes that the nation is on the right track both economically and politically. However, just one-third of that group says the U.S. is on the right path culturally, and even fewer (just one-quarter) say things are moving ahead well morally. 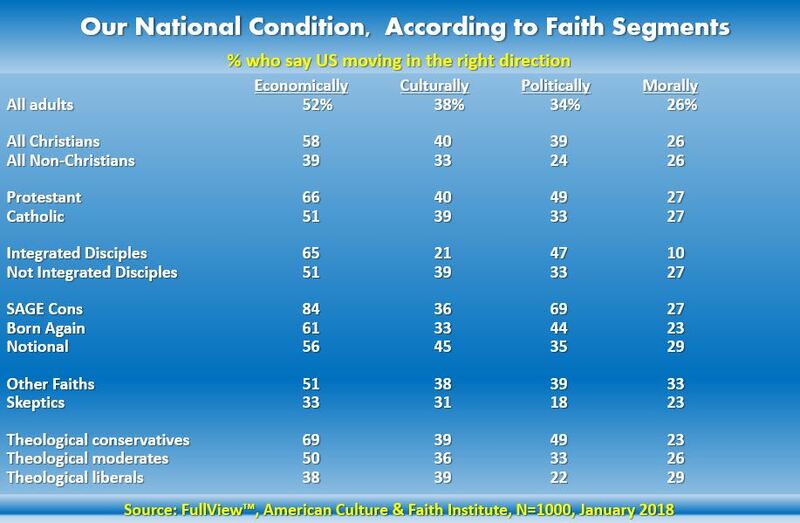 Skeptics emerged as the faith group that is most sour on the direction the nation is moving. Skeptics – a niche composed of atheists, agnostics, and people with no religious interest or activity – are the fastest-growing faith group in the U.S. They provided the lowest levels of support for the nation’s current path related to economics and politics, and registered the next-to-lowest scores regarding our cultural and moral paths. Americans who are aligned with faith groups other than Christianity were more similar to Christians in their outlook than they were to Skeptics. Adults who attend a Protestant church were somewhat more likely than those attending a Catholic church to view the US as on the right track politically and economically. Catholics were slightly more likely than Protestants to view the U.S. as pursuing the proper path morally and culturally. Arguably the biggest division in perspective relates to the nation’s morality. While the percentages of people saying the U.S. is on the right track morally are very similar across faith groups, the reason for those responses are polar opposites. For example, the lowest scores on the moral direction of the country came from Integrated Disciples (i.e., people who possess a biblical worldview) and Skeptics (i.e., people who do not believe the Bible is “holy literature” or the literal/inspired word of God). Although a large majority of both groups said the nation is on the wrong track morally, Integrated Disciples contend that it is because America is straying too far from biblical principles. Skeptics, in contrast, believe the nation is moving in the wrong direction morally because American society remains locked into outdated biblical morals. One consequence of this finding is that the distance the nation must travel to bring people together on moral issues is greater than the distance required to generate unity in the other societal dimensions evaluated.